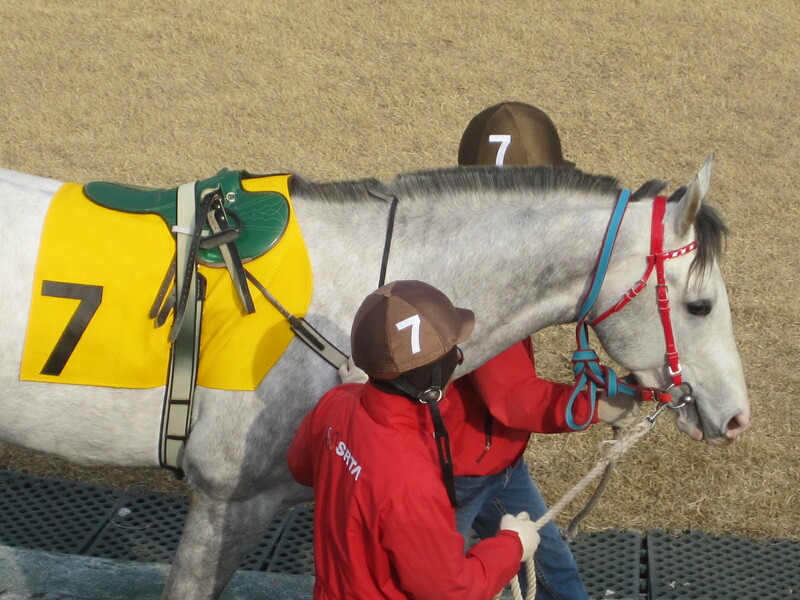 Sad news out of Jeju Island as stallions Yankee Victor and The Groom Is Red have both died within the last month. Yankee Victor succumbed to a colic on February 1 while The Groom Is Red had to be euthanized after sustaining multiple fractures in a paddock accident on January 27. 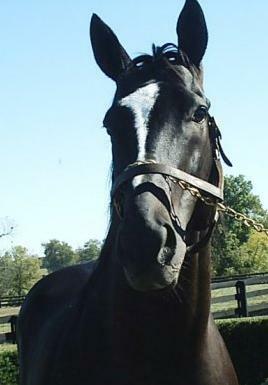 Yankee Victor [Saint Ballado – Highest Carol (Caro)] had been in for five years. On the racecourse in the US, Yankee Victor won eight of his nineteen races. A fine miler, in 2000, he won a pair of Grade 1 races over the distance – the Met Mile at Belmont Park and the Westchester Handicap at Aqueduct. 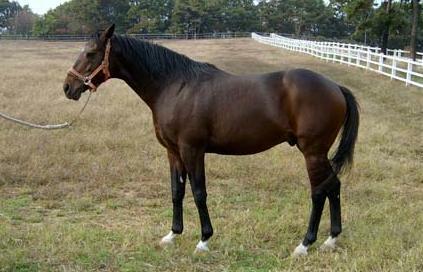 Retired to Stud, he was moderately successful in the US before being bought by the KRA in late 2005. Just becoming established as a sire in Korea, he’s had just two crops of foals reach the track so far both including some promising runners. The Groom Is Red [Runaway Groom – Sheena’s Gold (Fast Gold)] won just four times in the US. Just like Yankee Victor, his biggest triumph also came over a mile at Belmont when, as a two year old in 1998, he won the G1 Champagne Stakes. 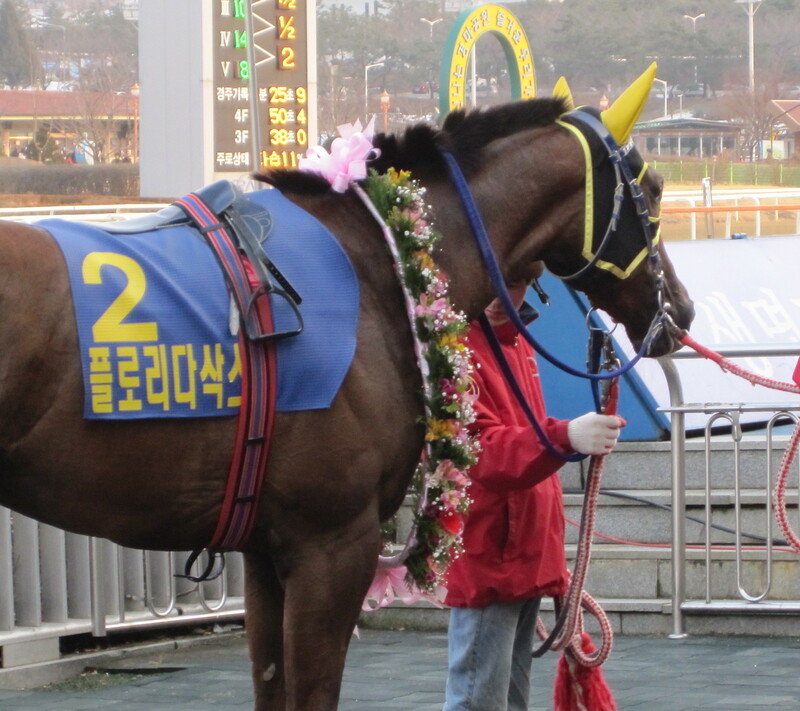 Brought straight to Korea as soon as he retired from the track, he would have been entering his twelfth season. Siring solid if generally unspectacular horses, he nevertheless produced some champions including the great grey Baekgwang, winner of the Minister’s Cup in 2006, and Triple Seven, Ttukseom Cup winner in 2010 as well as Andy’s Runner, winner of this year’s New Year Stakes. While snow has been more common of late, today the whole of the Korean peninsula saw its first rainfall for quite some time. 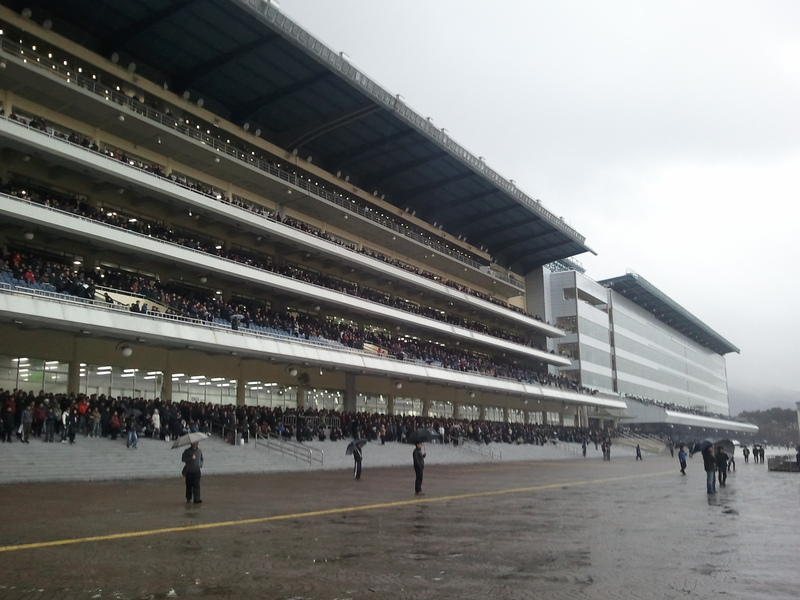 And a lot of rain it was too as the cards at both Seoul and Busan were run in torrential conditions. 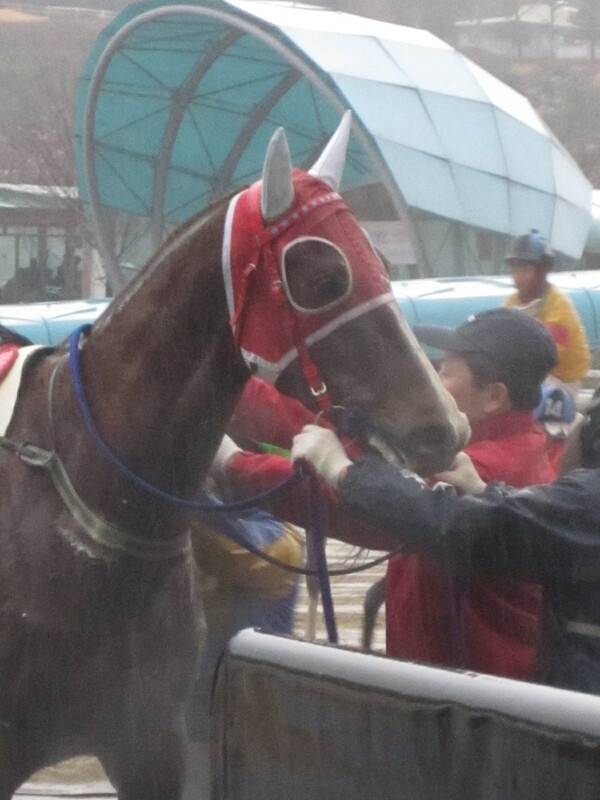 Not that a lot of the horses seemed to mind as Baekjeonmupae , fresh from defeating Tough Win and Dongbanui Gangja, continued his rich vein of form by taking out the first of co-feature races in the capital. The New Zealand bred six-year old swept wide of the field to claim victory in the seven furlong handicap by a commanding four length margin from outsider Bugmyeongsingong. Baekjeonmupae (Anziyan) moves onto twelve career victories but from the same race, a special mention must go to Bally Brae (Yarrow Brae). The 2007 Grand Prix winner and former Horse of the Year is a shadow of his former self but is still healthy and in racing shape. Today he was just beaten out of third place by a neck by Kahnui Jeonseol but took fourth and with it his first money win since May last year. In the second co-feature, last year’s champion filly and mare Love Cat was sent off as favourite, but it was Suseong TX who took the honours by overhauling long-time leader Natural Guy in the final furlong. 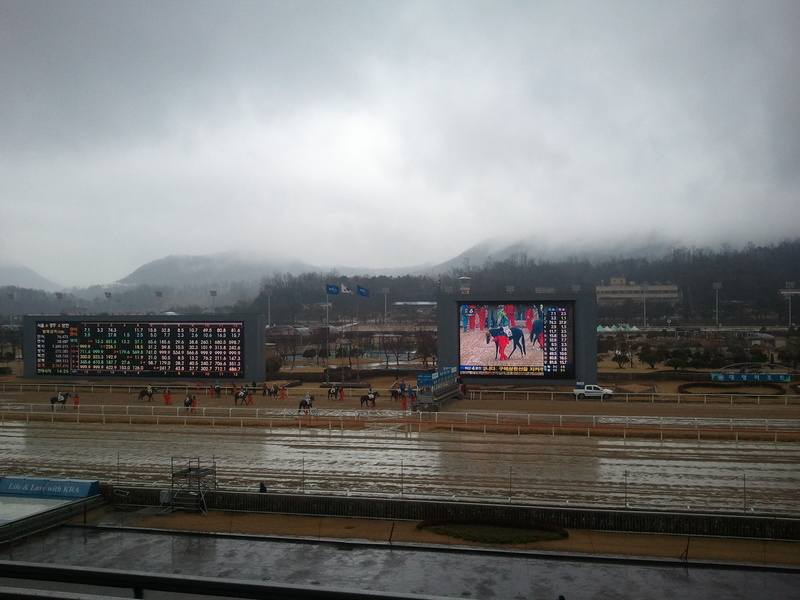 Down at Busan where the weather was equally wet and wild, the feature race went the way of six year old mare Daejaui Yeosin (Impeachment) who got the better of a photo finish with Mystery Boy (Ecton Park) at the end of the mile long handicap. 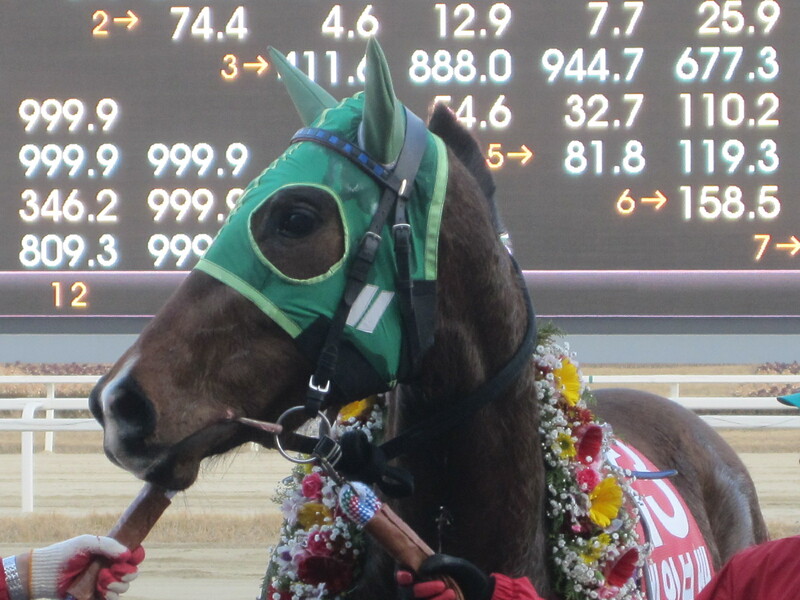 Earlier at Busan, there was a win for three year old Useung Touch. The Menifee filly grabbed a surprise third in the Breeders’ Cup last November and won on her season debut in January. While yet to be tested around two turns, she is a possible Classic entrant later in the year. Another yet to be tested at two turns is exciting American import Viva Ace (Macho Uno). He was sent off odds-on favourite today but came unstuck over 1500 metres as 30/1 shot Northern Diva (Northen Afleet) took the honours in the class 2 race 5. So concludes February’s racing on the peninsula, we’re back next week! So what do we make of this? Another colt on the Classic trail? Or is it that the ones that the ones who already were in the frame are not as good as we thought? 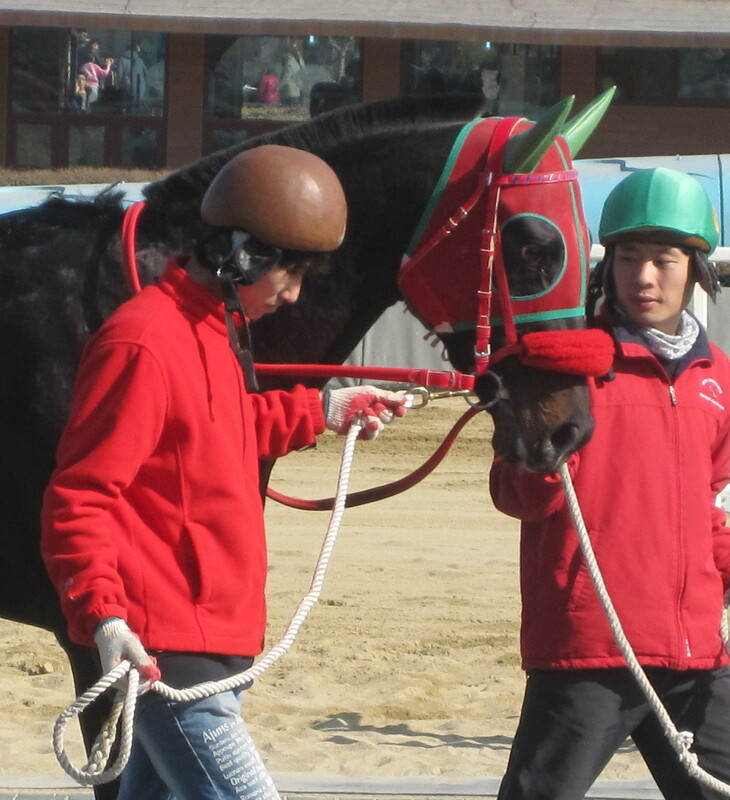 Two of the season’s brightest hopes came face to face at Seoul Race Park this afternoon. And both were soundly beaten. With the KRA Cup Mile, the first leg of the Korean Triple Crown, just over a month away, Ophelia (Commendable) and Gwangyajeil (Vicar) are among the highest rated of the three year olds who will be going after the Classics this year. Today, they both made their first attempt at 1700 metres – 100 metres more than the Cup Mile, a 100 metres less than the Derby. They were sent off as the top two in the betting, but both found themselves upstaged by another young colt. Singgeureounachim (Exploit) started at 14/1 but jockey Jo In Kwen timed his run just right to storm to a two length victory. Ophelia got caught in traffic but finished well in second while Gwangyajeil was never a threat in fourth. Ophelia’s strong finish suggested there is more to come while Gwangyajeil may have had an off-day. As for the winner, while recording just his second win from seven starts, he now finds himself amongst the Classic front-runners. 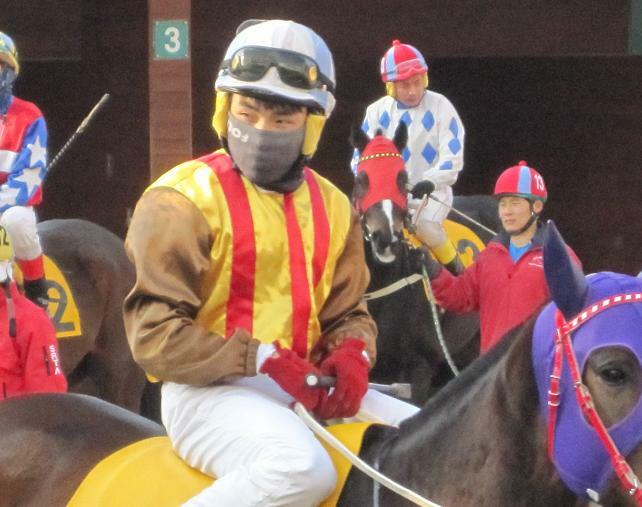 With Park Tae Jong, Moon Se Young, Cho Kyoung Ho and Jung Ki Yong among an unusually large number of jockeys sidelined this weekend due to injury (Park) and suspension (the rest), Jo In Kwen took full advantage. Aside from Singgeureounachim (you will forgive me if I don’t root for him during the Triple Crown as even by Korean standards, it really is a rather difficult name to type), Jo rode four more winners including both of the co-features on Cherokee Man (Sir Cherokee) and Jewang Tansaeng (Petionville). Racing returns to Seoul on Sunday with 11 races from 11:10 to 18:00 while there are 6 races at Busan from 12:30 to 16:30. Not much time this week but but look out for race 9 at Seoul on Saturday where Derby hopefuls Gwangyajeil and Ophelia (yes, despite the name, he’s a he) both try their luck around two turns of the racecourse for the first time. The winner – if it is either of them – will be installed among the favourites for the first Classic of the season, the KRA Cup Mile, at Busan in early April. Sunday sees old favourite Bally Brae dropping back to six furlongs in goodness knows how many years – and not being forced to carry top weight for goodness knows how many more – in one of co-feature races. Florida Sox put in a valiant defence of her title, but it was Kkakjaengi who came away with the victory in the Segye Ilbo Stakes Cup at Seoul Race Park this afternoon. Florida Sox, who had struggled with injury since winning the event last year, was sent off the odds-on favourite and led for six of the seven furlongs of this, one of very few Stakes races on the calendar for imported fillies and mares. 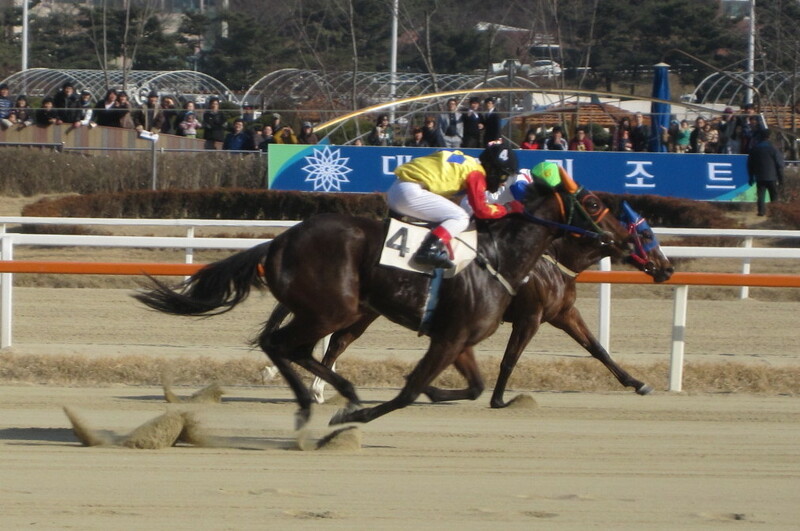 Yet in the final furlong, the four-year old had nothing left and Kkakjaengi, a year her junior, swept by to win by half a length from Geumbi with Florida Sox hanging on for third. Kkakjaengi (Put It Back) is a talent. Although she finished next to last in her debut last September, since then she has three wins and two seconds from five outings. 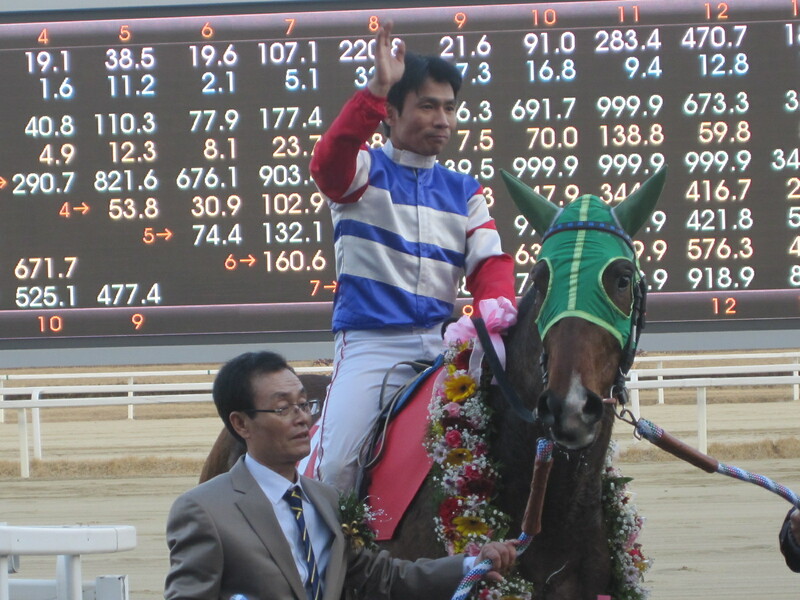 For jockey Shin Hyoung Chul, one of the most experienced in the weighing room, it was a first Stakes victory since he won the Ttukseom Cup on Namchonuijijon in 2008. Earlier, on a glorious spring-like afternoon at the races, another filly returned to form. Magic Party (Artie Schiller) was originally entered in the Segye Ilbo but steered clear in favour of taking on a class 3 field in race 7. After disappointing at two turns, she dropped back to seven furlongs and scored a comfortable win. Magic Party, winner of the Gyeonggi Governor’s Cup was one of last year’s stand-out two year olds but, having been sired overseas (although born in Korea), she’s ineligible for the three-year old Classics. A colt who is very eligible, however, is Shoot In (Exploit) and he made his much-anticipated second track outing in race 6. Midway down the home straight, it looked as though jockey Cho Kyoung Ho may have left himself too much to do as Shoot In had several lengths to make up on the leaders. Make them up he did with a little burst of speed a furlong from home to win, easing down, by two lengths. There will be greater challenges – not to mention distances – for Shoot In to contend with if he is going to be considered a Derby horse, but so far, he’s doing everything right. On a very busy day of racing, there were two shocks and they came in the feature handicaps at both Seoul and Busan. In the capital, Ace Galloper was looking for his eleventh win from sixteen starts and punters sent him off at odds-on to achieve it. They reckoned without Hongji, an old-stager who’s always in the minor money but rarely lands a win – his last was in March 2009. Ace Galloper had him in his sights in the final furlong but the line came soon enough and the eight year old Hongji recorded his tenth career victory. Down at Busan, the wonderful Yeonseung Daero was yet again the only Korean bred horse taking his chances against the imports in the feature race. He’s so good at it, he too was sent off odds-on. Hitting the front with a furlong to go, it looked like a thirteenth win was his for the taking but suddenly, creeping down the rail, was the venerable nine-year old Admiral Reigart [General Royal – Entoria (Stop The Music)]. The Admiral gained and gained and on the line, had the better of Yeonseung Daero by a head. It was quite a battle and both jockeys picked up fines for excessive whip use. Ultimately, Admiral Reigart gained his first win for a year and his eighth overall in a sixty-five race career which began in 2004. He’s not even a gelding. So ended the first really glorious day of racing of the year. 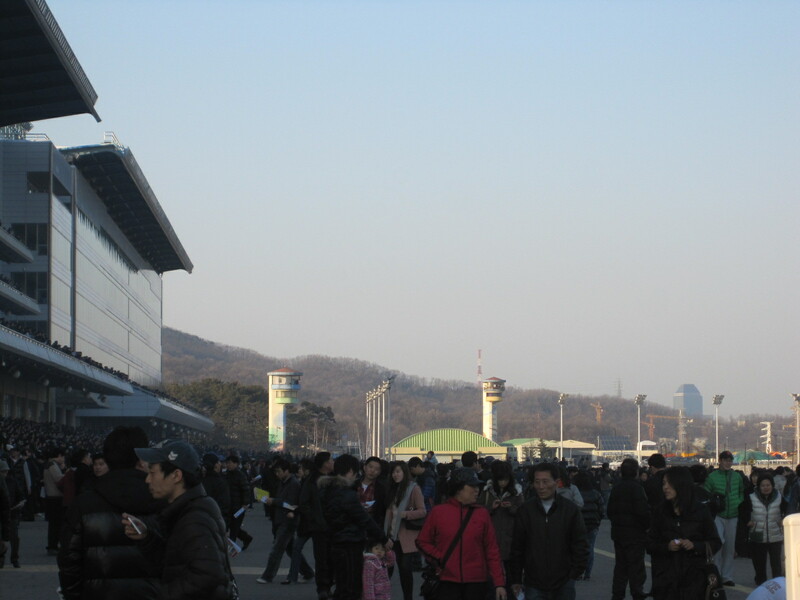 With temperatures in double figures at both tracks, big crowds were in. Kkakjaengi was the toast of the Segye Ilbo Cup. It will be a major surprise if she, like Florida Sox, is still in class 2 this time next year to defend it. Florida Sox To Defend Crown / Larrycat, the “Daero’s”, Ace Galloper all in action! One year ago this weekend, Florida Sox stormed to victory in the Segye Ilbo Cup. No-one expected then that today she would be able to return to defend her title in 2011. Defend it she will, however, as injury ensured that much of the rest of her 2010 would be spent on the sidelines making her unable to make what looked like being smooth progress out of class 2 racing. Returning from her long lay-off in with a win in December, Florida Sox (Woke Up Dreamin) has had another two months to prepare for a tilt at a second Segye Ilbo at Seoul Race Park this coming Sunday and improve on her career record of four wins from six starts. She’ll face thirteen rivals in one of very few Stakes races specifically for overseas bred fillies and mares. Some experience mares will take on some up and comers such as Geumbi (Ecton Park) who has four wins from seven starts and Kkakjaengi (Put It Back) and Blueband Mama (Purge). Saturday at Seoul sees Larrycat (Fantasticat) make his season debut. 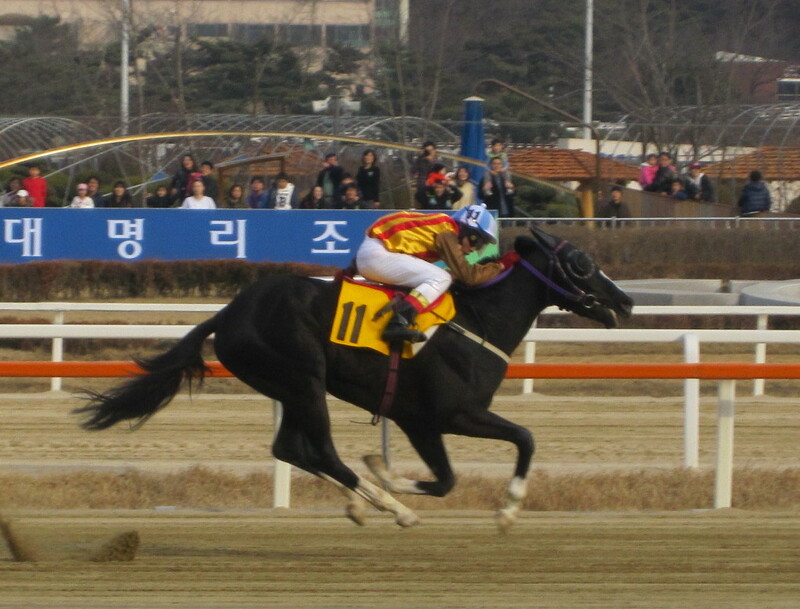 Now four, he’s not been a prolific winner but finished third behind Tough Win and Dongbanui Gangja in the KRA Cup Classic and then beat them both when running second to Mister Park in the Grand Prix. 2011 could be his year and he goes up against the likes of KJ Khan and Jumong in Saturday’s feature race. Classic possible Double Light goes in race 10 on Saturday while after the Segye Ilbo is over and done with on Sunday, Ace Galloper, with ten wins from fifteen starts, will head the field for a big class 1 handicap. Former Champion mare Lucky Mountain will join old-timers Gi Ra Seong and Hongji as well as New Year’s Stakes winner Andy’s Runner in trying to beat him. Some stars will also be on show at Busan this week. 2010 Korean Derby winner Cheonnyeon Daero will be looking for three straight wins in Friday’s feature event while on Sunday the other “Daero” (it means “Road”), the fearless Yeonseung Daero once again takes on the overseas imports in the big race. Seoul Racecourse has a new foreign steward. James Smith made his first appearance behind the binoculars this past weekend. 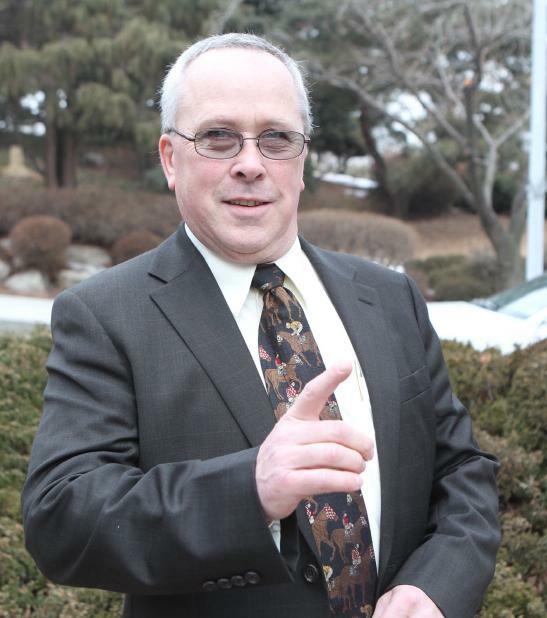 Smith who – if the picture to the left is anything to go by – is a man who clearly appreciates a good tie, is a fifty-six year old American and has spent most of his career officiating at tracks in Oregon, principally Portland Meadows but has also had stints at Minnesota’s Canterbury Park and Iowa’s Prairie Meadows. He’s joined what is usually a five-man panel at Seoul but will occasionally be seen guesting at Busan and Jeju as the KRA likes its stewards to sit on different panels from time-to-time. Down at Busan an Australian, Brett Wright, is currently Chief Stipendiary Steward. In addition to race day duties, the job description of overseas Stewards in Korea also includes being a “Special Advisor” on racing related issues, particularly with regard to the “internationalization” of Korean racing – not an easy task in Seoul. The position had been vacant for five months since previous incumbent James Perry returned to his native Australia last September. Perry was sadly lost in the Queensland flooding last month.